Robert Mueller is recommending “no jail time” for Gen. Mike Flynn after the Special Counsel ruined his life. 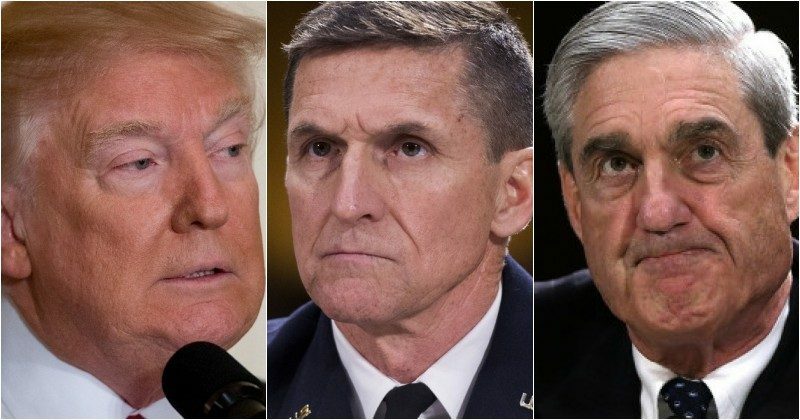 Mueller’s heavy-hand caused Flynn to sell his house, and then, when Mueller claimed he had “something” on the general’s son, unrelated to Russia collusion, Flynn, who was out of money, plead guilty to lying. Now, Democrats and their cohorts are celebrating, thinking the 60-year-old general has spilled the beans about President Donald Trump and Russia collusion, but they are wrong. For those of us who have studied the so-called Trump-Russia collusion case, the one person who was in the wrong place, at the wrong time, was General Mike Flynn. Trump appointed Flynn to take over for Susan Rice as his National Security Advisor, and that’s when all the trouble started. The little-known problem with Flynn was his connections with Turkey. In fact, the highly-decorated general never lied. Leftist media outlets that refuse to wade into the weeds of this case simple say he lied about two December 2016 conversations with Russian Ambassador Sergey Kislyak in an interview on January 24, 2017, with federal investigators. He didn’t. Even former FBI Director James Comey, who was overseeing the case, said Flynn didn’t lie. Why would he? Talking to foreign entities in January 2017 was his damn job as the next director of the NSA. Do you see how this was a witch hunt on Gen. Flynn? He pleaded guilty to lying, but his real crime was running out of money to defend himself against these charges. What it finally came down to was his lobbying for Turkey. Since Mueller couldn’t get him on anything else, they examined the three-star general’s life under a microscope. Now, Mueller is admitting in his highly-redacted sentencing recommendation that Flynn is guilty of violating the FARA act, which is another thing no one ever gets prosecuted for. You see, campaign advocate and Trump campaign adviser Michael Flynn was being paid to lobby in DC on behalf of the government of Turkey and Recep Tayyip Erdogan, reports the Conservative Treehouse. And, it was Mueller’s words in that same sentencing memo that are causing the leftist media to go bonkers. The Special Counsel said Flynn had given them “substantial assistance,” hinting Mueller has some smoking gun evidence on Trump. This is all a big show, and oh how Mueller is now regretting ever hinting at such a thing. What are process crimes? They are crimes caused by the Mueller’s team investigation! They are not crimes committed before the Special Counsel got involved. For example, George Papadopoulos hadn’t committed a crime. He went to jail for supposedly lying to the Special Counsel over something unrelated to anything important in this investigation. In essence, Robert Mueller and his team of dirty rats are causing the crimes to happen, like asking questions repeatedly until an answer is just different enough to call it lying, and the crimes don’t have anything to do with the so-called Trump-Russia collusion case. Now, if Mueller had anything at all on Trump, he wouldn’t be prosecuting process crimes. So, when you see the Democrats and their cohorts celebrate, saying, “Mueller’s charged 19 people so far,” what they fail to understand is that none of those people or their crimes have anything to do with Trump and Russia. Not one of them. “Flynn has had to sell his home to pay his legal bills during this process. His 33-year career serving our country seems to have meant little to the prosecutors trying to get him to turn on Trump. Although we have no direct evidence for his sudden decision last year to plead guilty and cooperate, many believe that this was done to protect his son from being prosecuted,” reports the American Thinker. This is a horrendous abuse of power by the Robert Mueller team. In the end, Mueller will write up a heavily-biased anti-Trump report. But, he has zero power to do anything to Trump. Instead, the Democrats will use the Mueller report to spin lies and feed them to the American people. But, they made one huge mistake. President Trump is a known counter-puncher, and he will fight back with the truth and get re-elected in 2020.